Home / Business and Marketing / product or service reviews / Travel and Living / Win a Million JPMiles as part of Jet Airways Billion Miles Festival! Win a Million JPMiles as part of Jet Airways Billion Miles Festival! Jet Airways, India’s popular domestic and international carrier is currently celebrating A Billion Miles Festival, on till end of March 2017. Millions of JP Miles are waiting to be disbursed among Jet Airways customers who book their flights during the offer period. 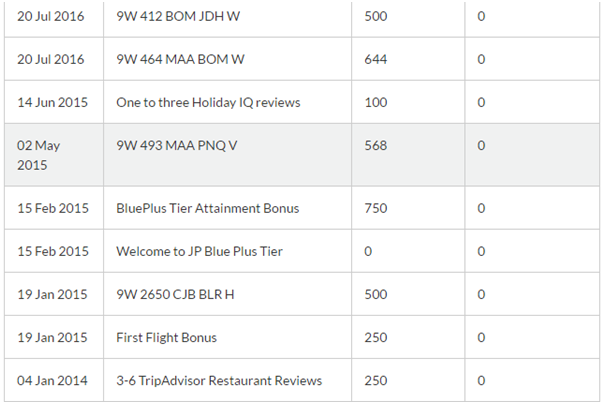 In case you’re wondering what is JPMiles, it is the Loyalty and rewards program from Jet Airways. 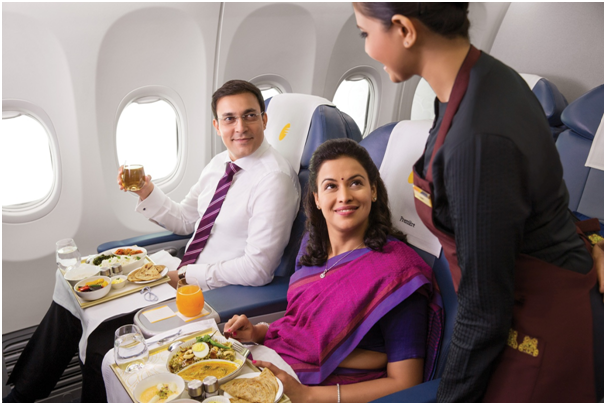 As you pay and fly Jet Airways, you get to accrue these loyalty points and redeem them periodically for free flights or upgrades or other benefits. How much JPMiles will you earn when you book with Jet Airways? Besides flying, there are many other ways to earn JPMiles. From time to time, Jet Airways ties up with various brands- such as Holiday IQ, Tripadvisor etc and you can earn JPMiles against your contribution to these sites. I am guilty of not exploiting this option enough. What can I do with 1 million JPMiles? What is it worth? Your next question would naturally be, what are these JPMiles worth? What can I do if I win that grand prize of 1 million JPMiles? What would I do if I had a million miles? If that happens, it would be my ticket to conquer the world. Trip 2: Vacation with spouse in Kashmir in luxury: A round trip for 2 in Première class from Chennai to Srinagar and back would set me back by about 136000 JPMiles, from the 6 lakh JPMiles balance. Trip 4: Solo trip in Middle East: While I have travelled fair bit in Asia and Europe, haven’t explored Middle East much. Would love to use JPMiles opportunity and explore Muscat, Abu Dhabi and Dubai. Fly to Dubai and back for about 90000 JPMiles, in Première class. 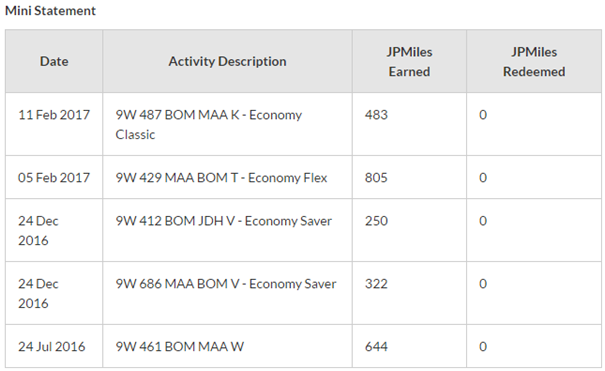 One main advantage of JPMiles is that miles required to fly to a destination doesn’t vary by date. If your travel is immediate, buying tickets by cash can be expensive, whereas redeeming JPMiles will be a lot sensible option. 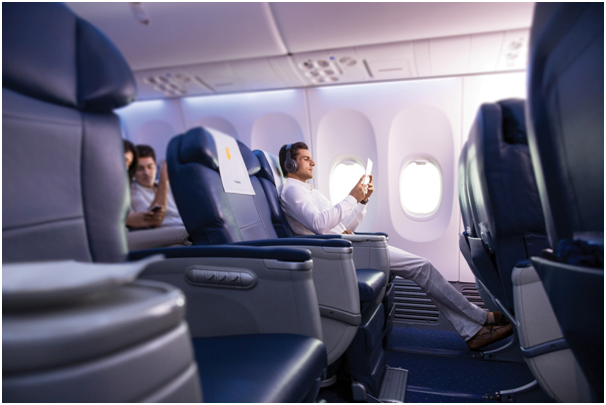 Why wait, head straight to JetAirways website, know more about “A Billion Miles” offer and book your next trip. All the best from my side. 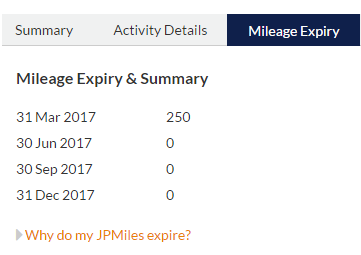 Keep an eye on Mileage expiry tab. The miles earned cannot be held forever, you need to keep making fresh bookings to avail these miles. Because of this post I realized that I have 250 JPMiles expiring end of this month. No idea how much I lost in already expired miles. Disclaimer: All information as seen on JPMiles calculator at the time of composing this post. JPMiles requirements are subject to change at the discretion of the airline. This post is in association with Jet Airways. In-flight photos supplied by the brand. Content is my own and screenshots are from my own JPMiles account.